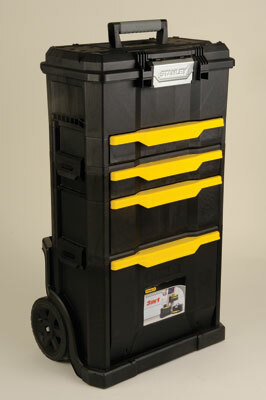 Stanley Tools are synonymous with yellow and black and none more so than their storage and work cases. 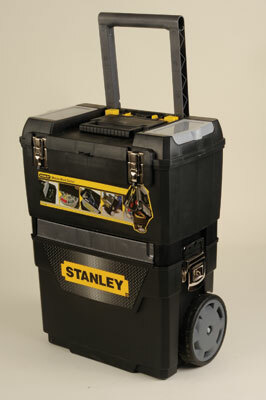 Every craftsman needs to safely store and carry his or her kit and Stanley have a solution for just about every situation, whatever your trade or skill. The most robust model, the top is a work platform with a slot to hold timber while sawing. It has heavy duty clasps, and a cunning lever that allows the whole thing to cantilever backwards with your foot on a side step holding it. The flush fit trays mean you won't lose stuff if it is tipped over. It would be suitable on a mucky site as the wheels can be washed down afterwards. A defect is that the pull up, pull along handle can be moved past its stop position making it liable to damage if care isn't exercised. The tallest unit on test, it has oversize wheels and an extending pull along arm. At the rear there are wells to take spirit levels, etc. and bungee points. 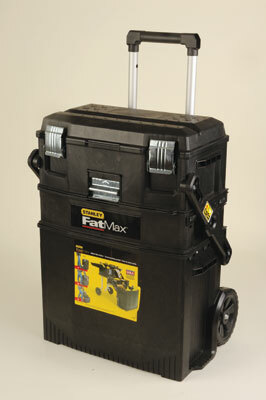 The top has a flip down handle and a saw slot and the whole unit can be unclipped to divide into two or three stages. Thus you can choose which sections you need to take to a job or make it easier for van stowage. The upper two sections have plenty of storage for components, drill bits and smaller tools but the pullout drawers aren't flush-fit, so you can't tip this unit on its back. The best unit overall but not the most robust. This low level pull-along unit has lever clasps that can be padlocked although the metal backing plates aren't that strong. There are useful storage compartments on the lid top for oddments and drill bits. The oversize wheels are ideal around the work site and the pullout handle retracts fully when the unit is in use. A large internal tray can hold a variety of smaller components and tool accessories while the large bottom storage can cope with about three power tools and various hand tools. 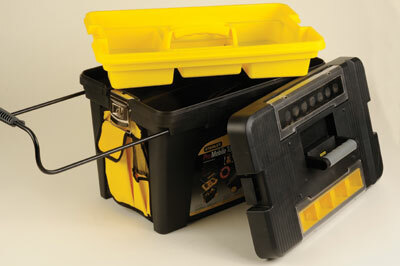 Ideal for carpenters, maintenance work or specialised router working. A neat compact two-part unit. The top features a large pull along handle that is released to lay it flat, as well as its own smaller handle just for the top section which unclips from the lower part. The top box has two lid storage trays and inside a lift-out storage tray sits over a cavernous storage area. Underneath is a swing-out flush-fit tray for holding smaller items. The bottom section of the Work Centre is again large and capable of holding power tools and hand tools. The case mouldings are a little flimsy so care is needed when clipping the two parts back together. The clasps can be padlocked.